Description: Five rows, one central and two shorter ones on each side. 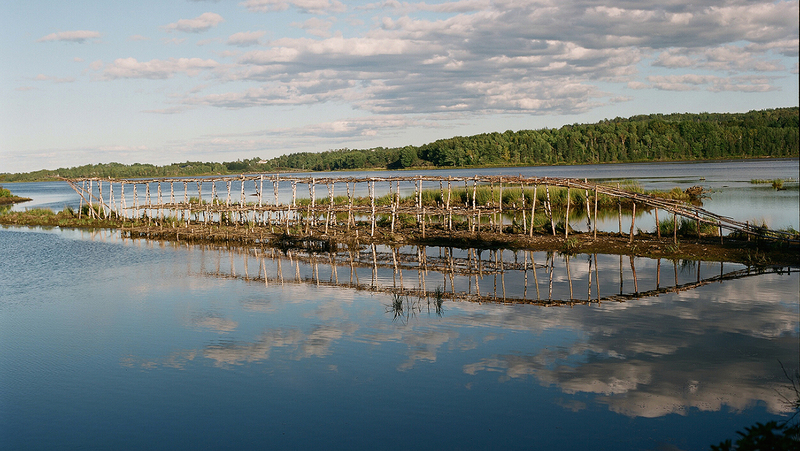 Each row is covered with an open mesh to catch plant matter brought in by the tides. They act as “tables” on the side rows and a “roof” on the central part. The five rows define the levels of the structure. 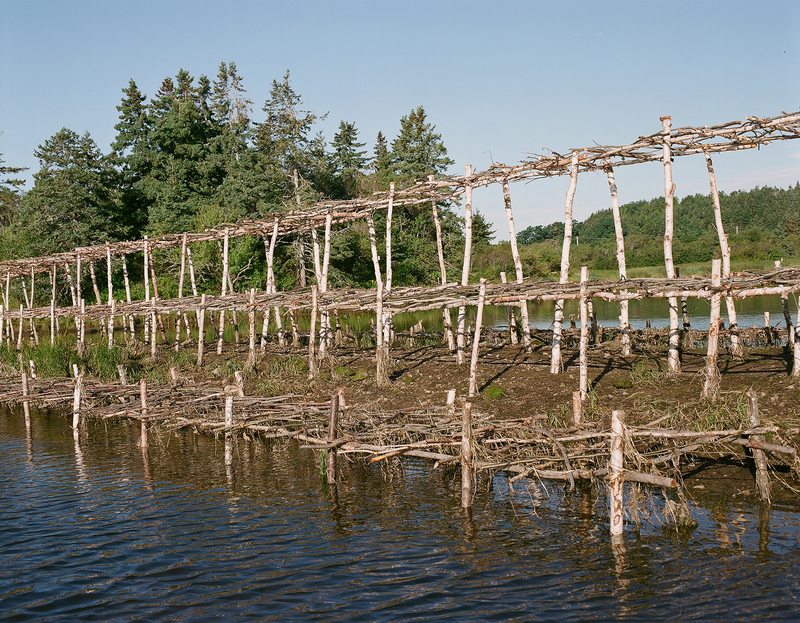 Gilles Bruni, French earth artist with an international practice, is collaborating with Fenn Martin, Antigonish ceramic artist, builder and organic farmer, to create our region’s first “earth art” installation on the flooded old roadway to the historic Antigonish Landing. Here, land and water, fish and birds, and the Mi’kmaq, Scots, Irish and Acadian peoples all came together in various modes of exchange, with their different aspirations and needs. These physical and cultural forces shaped and continue to shape the landscape that we see today. Landscape, Gilles Bruni says, is never just nature, but the expression of competing natural and social forces acting upon it. Today, these forces are undergoing the rising impact of climate change. In our area, the principal visible effect is predicted to be sea level rise, which is probably accelerating cliff erosion already along Antigonish County beaches and flooding of The Landing site. 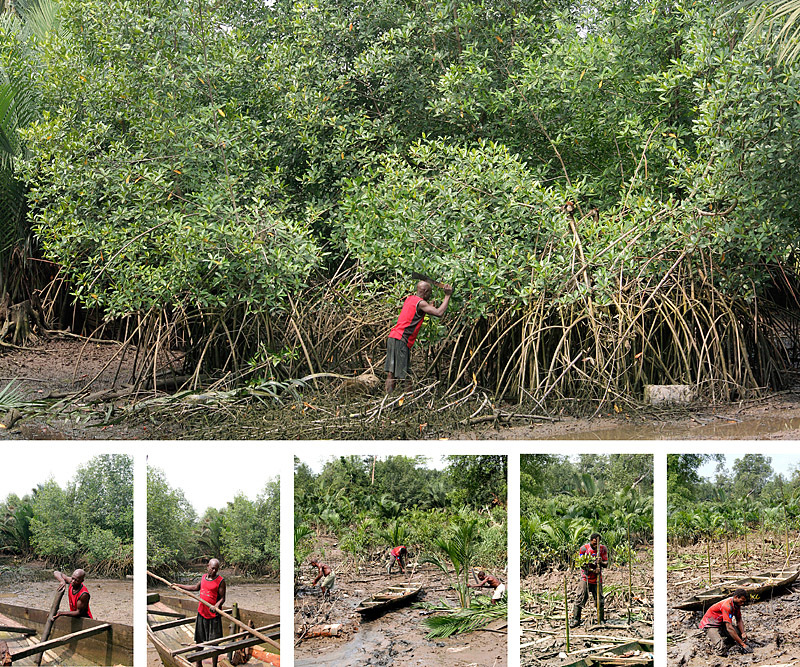 Changing temperatures and water levels will also affect sea and plant life. In visualizing the competing interests and natural forces that produce a landscape, Bruni looks for processes that shape a site. 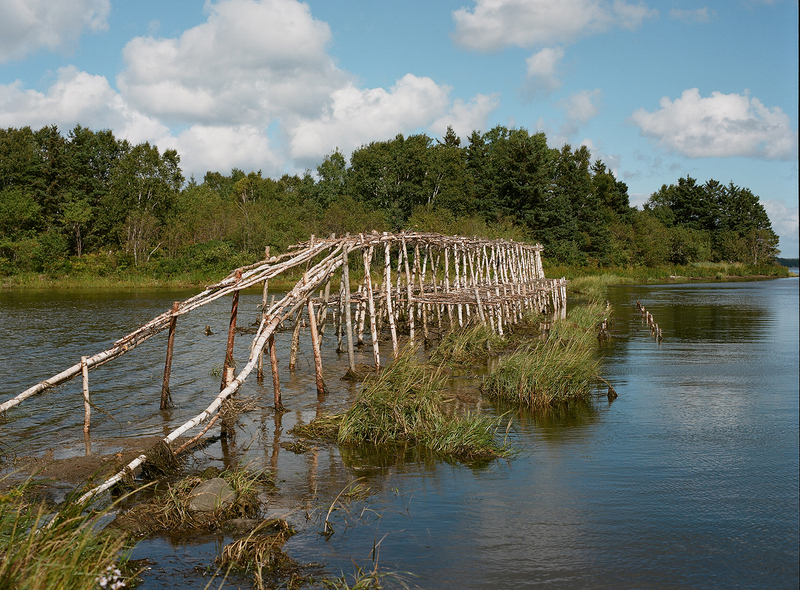 After days of watching the tides overflow and expose the site, the marsh life and detritus that accompany the tide, and of studying the social history of the Landing and Antigonish Harbour, he found a common process at work in both human and natural worlds: SEDIMENTATION. 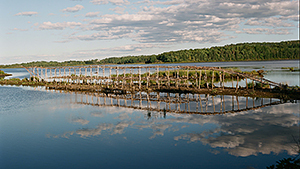 Layers of eel grass and mud appear daily; birds arrive to hunt incoming sea life. 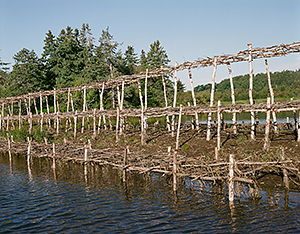 The Mi’kmaq hunted, trapped, fished, made baskets and hockey sticks, and practiced subsistence farming; the Europeans brought their agriculture, forestry, fishing, boat-building and commercial trading. Today, there is interest in conservation and recreation. Layer upon layer, these influences have been deposited on the Landing and continue to leave their marks. Bruni gives us sedimentation as layers descending on the old roadbed. 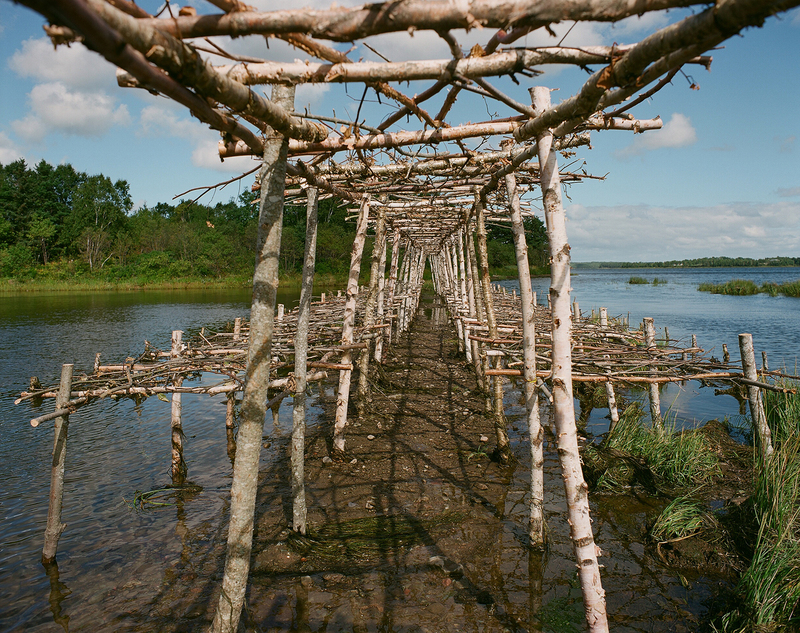 The lowest layer of birch trellises is underwater at high tide, catching detritus, while the highest allows visitors to walk beneath it and marks where future water levels might be. 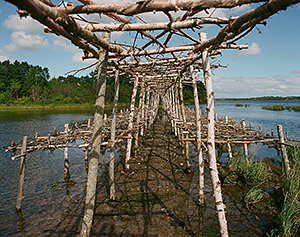 The ramp invites your imagination to ascend into the landscape and imagine its past and future—and your place in it. While the experience of The Landing can be understood in many different ways, by placing you at the centre of the installation and directing your attention up, down, and outward, the The Landing participates in creating landscape, understood here as a human activity. You might even think of this as a performance.